Now, let us use the app to find these values. 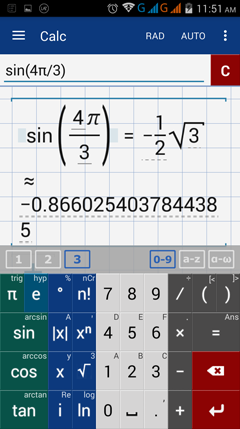 If you want to use π/6 , make sure that the DEG-RAD button is swift to RAD. If you want to use π/3 , make sure that the DEG-RAD button is swift to RAD. 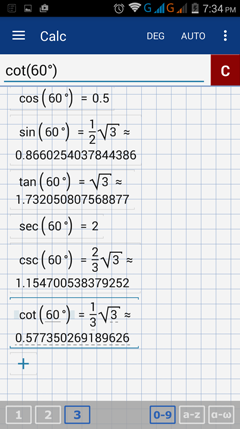 Now let us use these two special angles, 30° and 60°, to find the exact trigonometric value of some of its multiples. 1) Enter sine by tapping sin key once. Type 120. Add the degree symbol. Note: The terminal side of a 120° lies in quadrant II. The sine value is positive. 2) Enter cosine by tapping cos key once. Type 150. Add the degree symbol. Note: The terminal side of a 150° lies in quadrant II. The cosine value is negative. 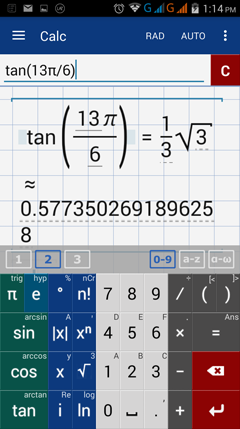 3) Enter tangent by tapping tan key once. Type 240. Add the degree symbol. Note: The terminal side of a 240° lies in quadrant III. The tangent value is positive. 4) Tap DEG button to swift to RAD. Enter sine by tapping sin key once. Type 4. Add the pie symbol. Note: The terminal side of a central angle whose intercepted arc measures 4π/3 lies in quadrant III. The sine value is positive. 5) Tap DEG button to swift to RAD. Type negative 5. Add the pie symbol. 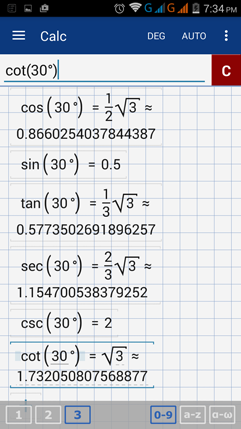 Note: The terminal side of a central angle rotated clockwise and whose intercepted arc measures 5π/3 lies in quadrant I. The cosecant value is positive. 6) Tap DEG button to swift to RAD. Enter tangent by tapping tan key once. Type negative 13. Add the pie symbol.